Oldenhammer in Toronto: Oldhammer Battle Report: Orcs vs. Skaven or "How I Learned to Stop Worrying and Love the Man-Mangler"
Oldhammer Battle Report: Orcs vs. Skaven or "How I Learned to Stop Worrying and Love the Man-Mangler"
In my first battle against 24_Cigarettes and his horde of Skaven, my army of Oldhammer orcs decided that they would fight "without da sissy stuff"... no war machines, no magic and no goblin fanatics. Brave, brave, stupid orcs. After getting beaten like a bowl of eggs, the survivors reconsidered their position. Maybe sissies aren't so bad after all. There's a lot to be said for killing your enemies from a safe distance. 6-man stone thrower with Orc crew. As 24_Cigarettes unpacked his war host, I prepared the board. 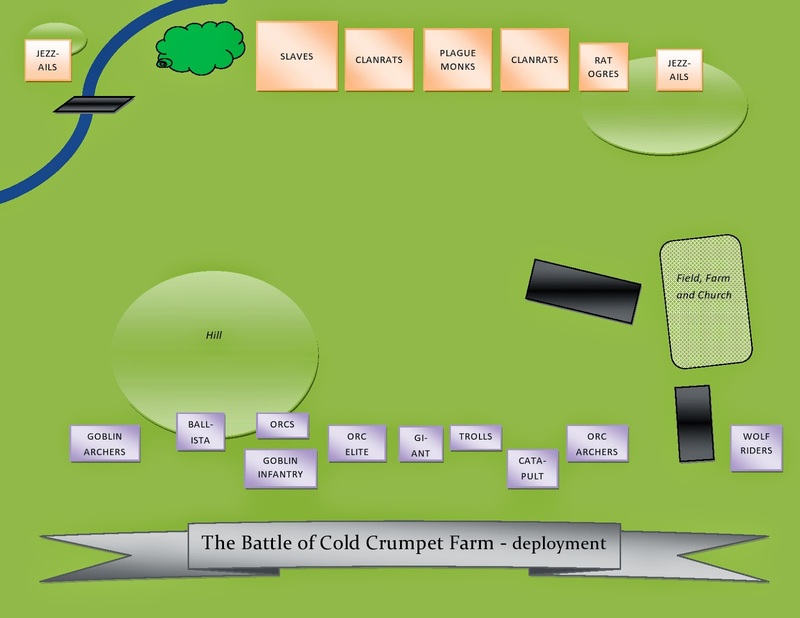 I wanted to give these armies something to fight over, so I set up a little human settlement ("Cold Crumpet Farm") for the victor to pillage and burn. The Church of Sigmar in the middle of the plain created a scenic obstacle, while various hills gave each army a chance to seize strategic highlands. The Skaven chose to take the north side of the battlefield -- a decision whose main motivation (I suspect) was to prevent the orcs from setting up their Man-Mangler on the safety of the hill on the far side of the river. At first, the Orc general Krapfang cursed the Skaven position, but over time he realized that it might all be to the best. 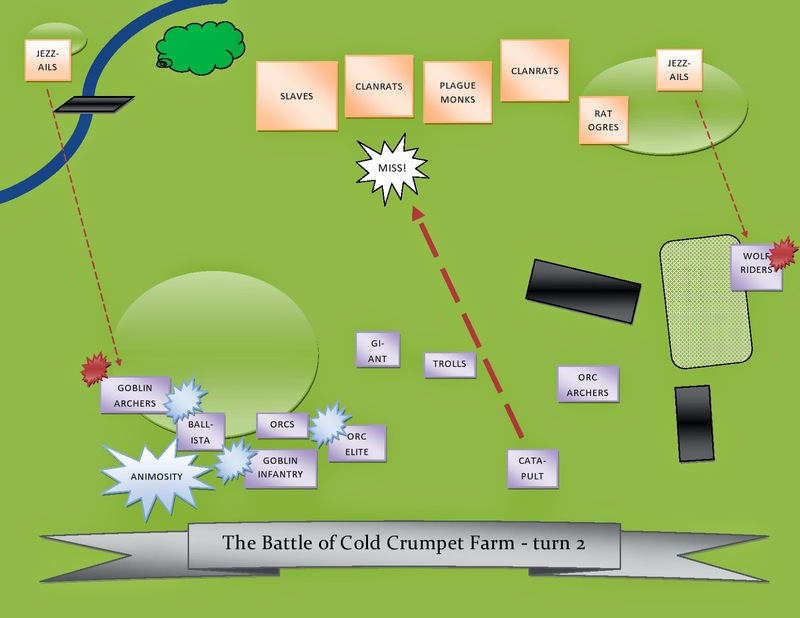 The open South side of the battlefield allowed him to stretch out his line, giving them room to maneuver and hopefully preventing the orcs from fighting amongst themselves. The Skaven general Xerxes adopted an interesting deployment. 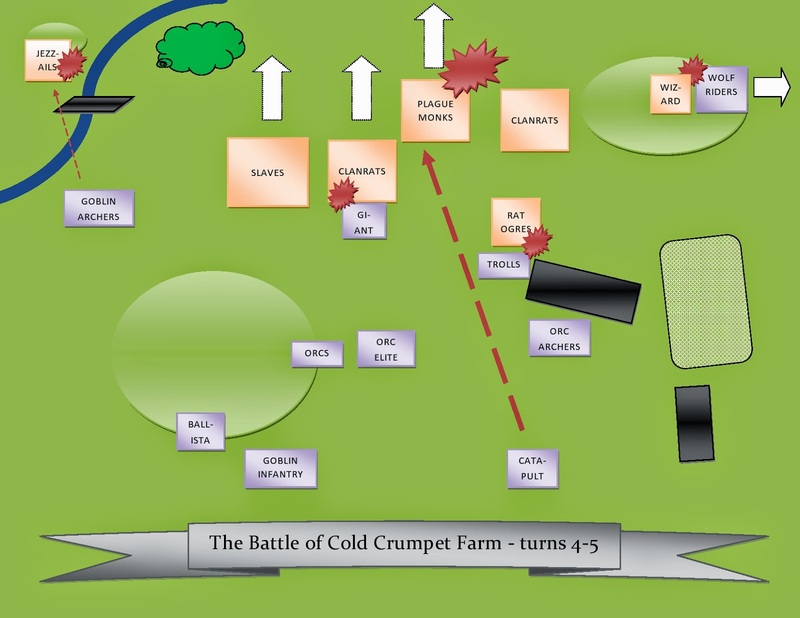 He concentrated his massive units of infantry in a dense line in the centre, leaving his flanks guarded only by Jezzailachis snipers positioned on hills at opposite ends of the battlefield. 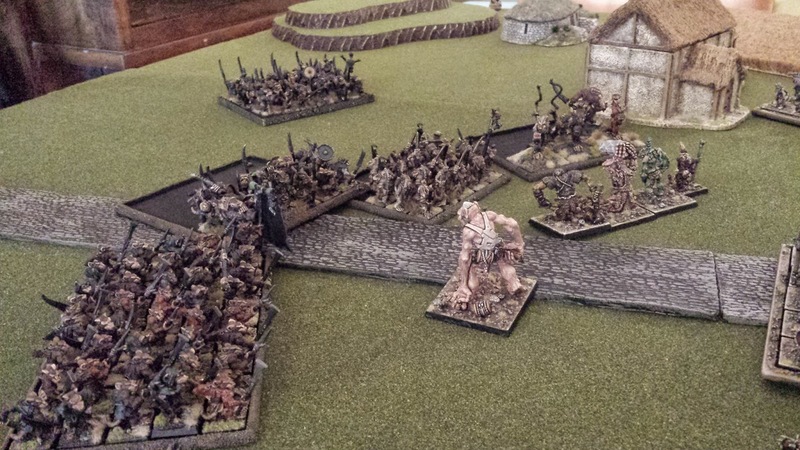 By weight of numbers, the solid wall of Skaven would be able to push back anything but a well-coordinated orc attack... and orcs generally can't coordinate themselves out of a ditch. Krapfang's strategy was not complex: he would try not to get himself killed. Thus, the bulk of the Orcs and Goblins would hold back ("mindin' da fort") while the Giant and the Trolls moved forward to do the actual fighting against the waves of Skaven infantry. Meanwhile, the goblin archers (on the left) and the wolf-riders (on the right) would drive up the flanks to neutralize the Skaven jezzail teams ("Git going, yer gits! Iz easy! No probs! Wish eyez going wit yurz!"). Krapfang likes to avoid the words "suicide mission"... it seems to be bad for morale. TURN 1: The opening of the battle was a mixed bag for Krapfang. 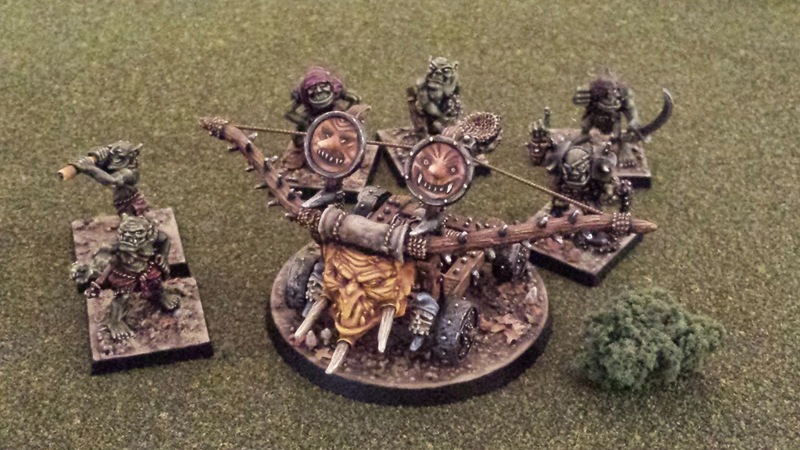 His sissy artillery missed horribly ("sissies"), while the Skaven jezzailachis shot nice clean holes all over the wolf-riders.To make matters worse, the Gobboe Great mob took exception to the Orcs' views on continental epistemology, leading to a brawl in the heart of Krapfang's army. On the upside, the mercenary giant, Rotwang Bawbag, showed up for work sober - a fact which, on its own, might determine the course of the battle. With resignation, he lurched forward to meet the Skaven phalanx, which was advancing at half speed from the North. TURN 2: Helmuth von Moltke the Elder famously observed that no plan survives contact with the enemy. Well, if you're an Orc general, no plan survives casual contact between your own units. On the second turn, Krapfang watched in agony as his whole line dissolved into a bickering riot. The ballista crew abandoned their post to hurl insults at the Orc infantry, who themselves were taunting Krapfantg's elite shock troops. The Goblin Archers sheered off from their crucial advance up the left flank and instead hurled homemade dungballs at the ballista crew, while the Gobbo Great Mob escalated matters by throwing actual javelins into the backs of Gritstool's Orcs. The only Orc leader who managed to keep his troops under control was Harboth. 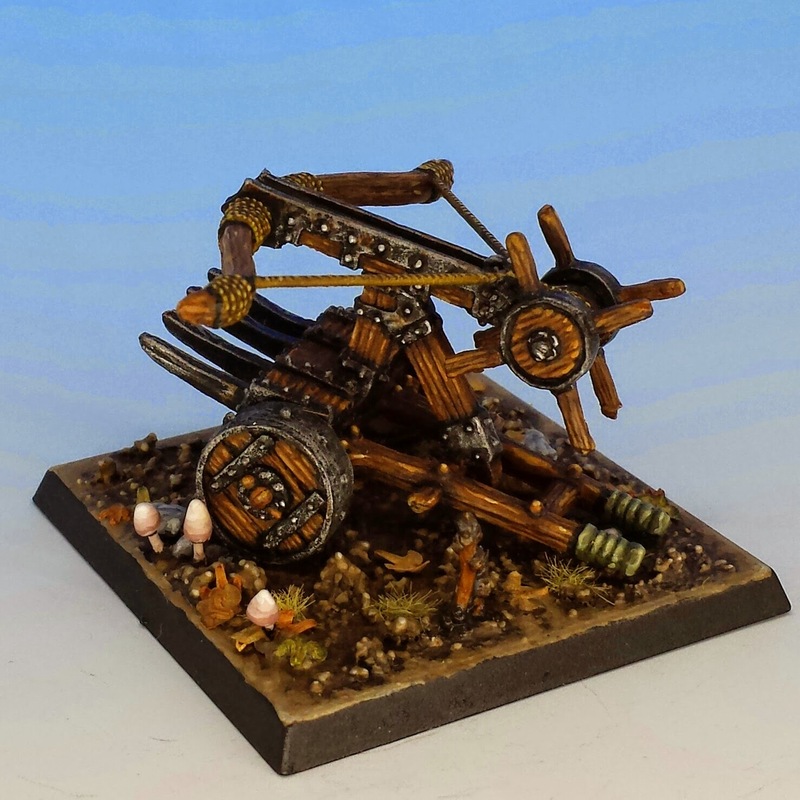 Hoping to hide them from both friend and enemy alike, he moved his veteran archers forward under the shadow of the Church of Sigmar. Distracted by the lively philosophical debate among their fellows, the Man-Mangler again missed its shot. But, on the upside, the Giant continued to trudge forward -- and amazingly, he was followed by Grogeye's Trolls. Despite severe cognitive and digestive impairments, these Trolls overcame their Stupidity Checks and mastered the art of marching forward. Could they keep it up? Could they really? And even if they did, would it be enough? They were marching right into the teeth of 100 Skaven, two warpfire throwers, a wizard and a warlord with a Parasitic Blade. TURN 3: As the armies began to clash, the Orc fortunes brightened. The Wolf-Riders, advancing like the Light Brigade into the face of relentless cannon-fire, routed the Skaven Jezzails on the right flank. 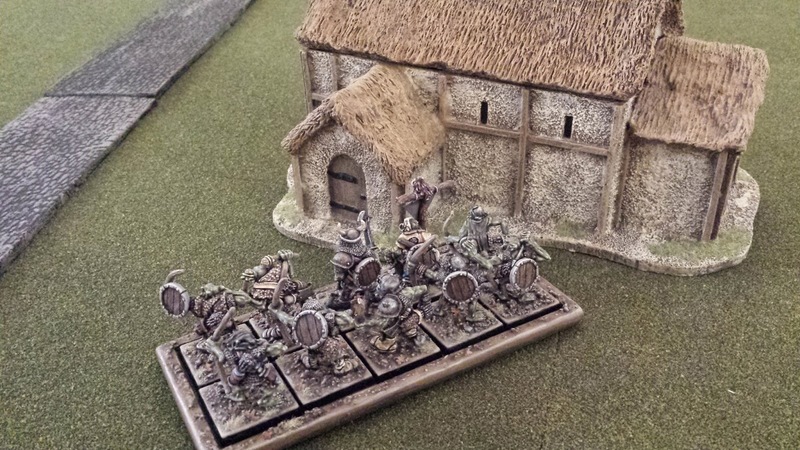 From behind the Church, Harboth peppered the Clanrats with arrows, followed by Grogeye the wizard, who struck them with a fireball from his unit of Trolls. Most importantly, the crew of the Man Mangler finally mastered the subtleties of trigonometry and landed a rock on top of the same poor Skaven sods. In a moment, nine perfectly nice Clanrats were transformed into tapenade. "Urk," bethought Krapfang to himself, "Dats purdy." The Skaven hold back and form into a crescent. In one of the most important decisions of the battle, the wall of Skaven opted not to close with the Giant and his Troll buddies. Instead, they held their position and readied the dreaded Skaven Warp-Fire Throwers. Green flame belched towards the Giant from two units of Clanrats... but one shot fell short... and the other sprayed wide. This was a godsend for the orcs -- not just because the Giant was still alive, but also because the stationary line of Skaven gave the Man-Mangler more time to do its thing. But the Skaven still had some tricks up their sleeve. 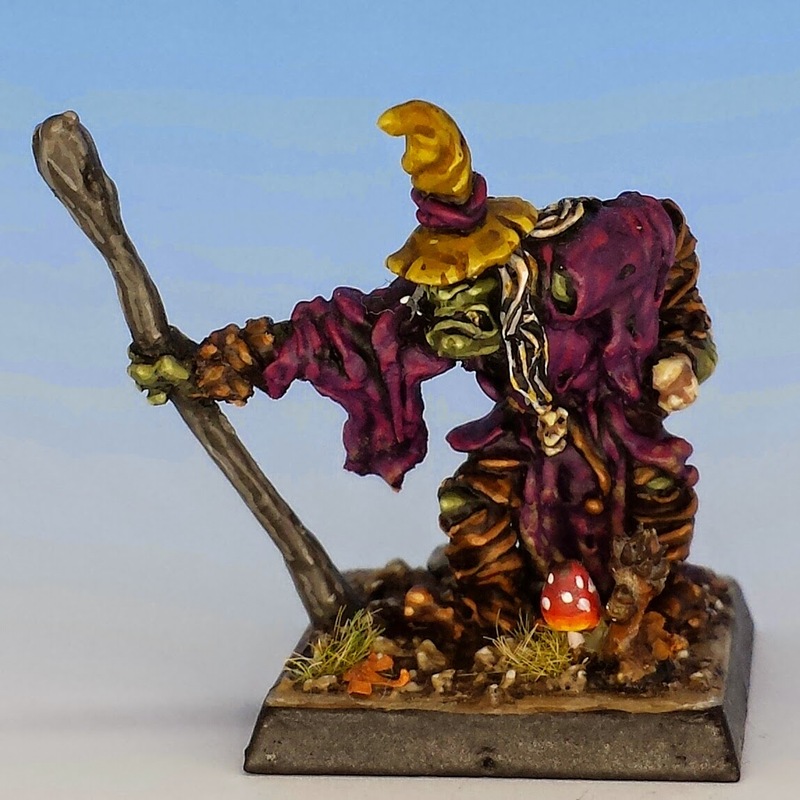 Festerlice, the wizard leading the Plague Monks cast Flight on himself and swooped down on the Wolf-Riders, tossing them like a salad with his enchanted Hammerhand. 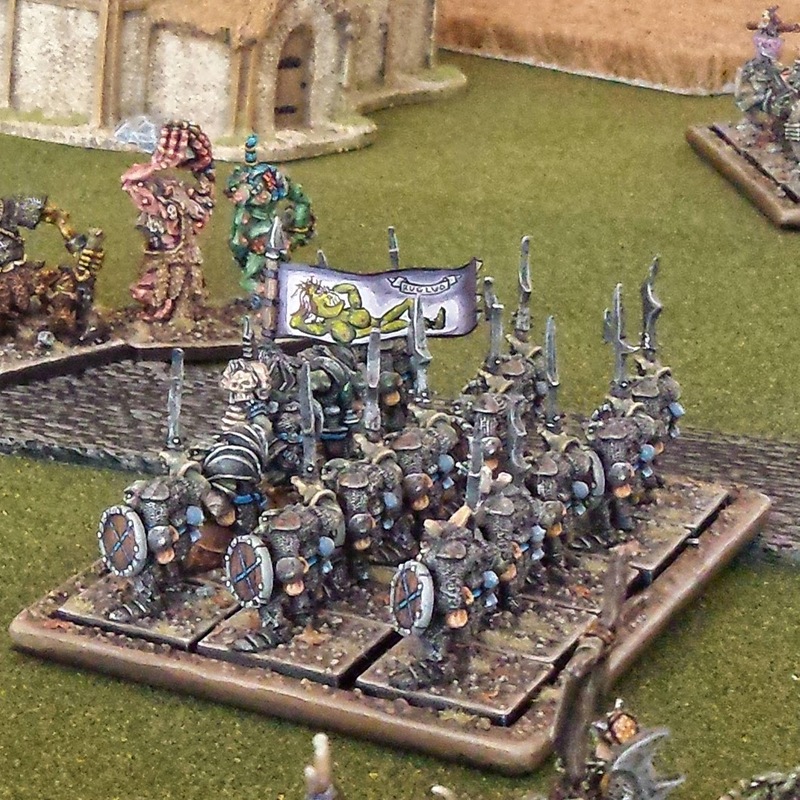 And the pack of Rat Ogres loped forward, preparing to charge into the Trolls. Crucially, the proximity of the Skaven triggered a loyalty role in the Giant, who was after all just a hired mercenary. Would he stay faithful to Krapfang? Or could the Skaven bribe him out, causing him to turn around and start bashing orc? It seemed the whole battle turned on that roll... but Rotwang stayed true. What a dupe. TURNS 4-5: The next two turns were a blur of mud, blood and beer. Against all odds, the tiny unit of Goblin archers got within range of the final Jezzail team and riddled them with arrows. On the opposite flank, however, the wolf riders fled from the Skaven wizard, although not before tying him up for a couple turns. His leadership would soon be missed in the middle of the battlefield. There in the centre, the action was heavy. The Rat Ogres rushed the Trolls, nearly scalping their leader, the unhygenic shaman Grogeye. In response, the three Trolls prepared to unleash their most devastating attack on the Skaven monsters: synchronized vomiting. On perfect cue they retched up a toxic brew of stomach juices all over the Rat Ogres... but the Rats were unfazed. Krapfant stood in horror... if they could stand up to that sort of abuse, they were unstoppable. But just before Krapfang began his strategic withdrawal, he saw the Man-Manger arc another rock over his head. This time, it landed smack in the middle of the Plague Monks, killing 15 of them in an instant. The surviving Monks wasted no time in hiking up their robes and sprinting for safety. In that moment, as the other rats began to waiver, Rotwang the Giant charged into the battered remnant of the Clanrats. This was too much for even the great Skaven warlord Xerxes. 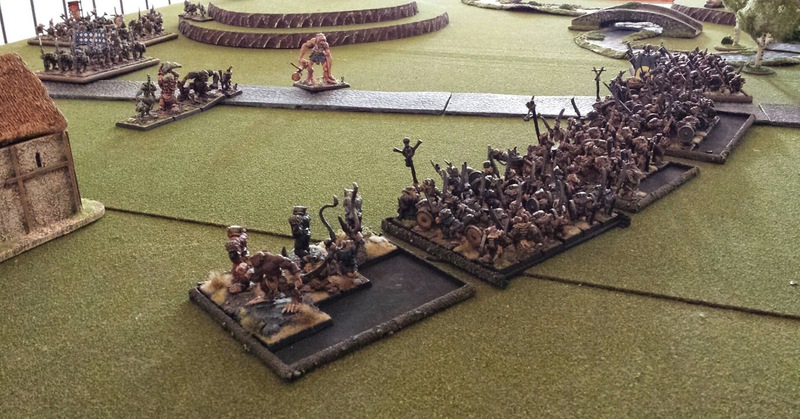 He broke, and by breaking he took a massive and untouched unit of Skaven Slaves with him. The other Clanrats would follow. The Skaven centre had collapsed. The battle for Cold Crumpet Farm was over. REFLECTIONS: One of the many things l like about 24_Cigarettes is that he was as gentlemanly in this defeat as he had been in his previous victory. Despite falling victim to some atrocious luck (i.e. his whole line collapsing in a chain of failed panic and rout rolls), my opponent was a complete sportsman. If you doubt me, check out his excellent battle report. I felt a little embarrassed, insofar that my victory rested on two over-powered units: Rotwang the Giant and the Man-Mangler. But perhaps worrying about "game balance" is not what Oldhammer is all about. In any case, a great deal of this battle did hinge on dice rolls; in 3rd edition Warhammer, a stone thrower has only a 40% chance of landing on target; I got lucky in landing two direct hits in a row. Leaving luck aside, I think the thing which characterized this battle was the hesitancy of both the armies' centres to advance. I know why Krapfang's Orcs didn't engage -- they were cowards and they wanted the Man-Mangler to do all the work. 24_Cigarettes's reasons for holding back are more interesting. He told me he was waiting for my Giant or my Trolls to put themselves out of position by making an over-extended charge. By shaping his units into a crescent, 24-Cigs was were getting ready to engulf my most powerful units, like Hannibal crushing the Roman legions with his curved line of Carthaginians at the Battle of Cannae. But (unlike the Romans) my sober giant refused to take the bait and plunge into the trap. Instead, Rotwang held back until the Skaven had been bombed beyond repair. Thank you, Man-Mangler. Machineries of destruction and massed units make for carnage. No doubt bloody good fun too! Holy cow it was fun. Impressive Battle report, must have taken you ages to make.! Not caring about game balance is definitely the way to lift a lot of weight offto truly enjoy the story taking place on the tabletop. It did take me a long time to write - but it was was a very fun process. I think you're quite right about letting balance go out the window in a good Oldhammer game... this isn't a tournament - it is story telling. This gets back to the close relationship between early Warhammer and roleplaying... something near and dear to my heart. 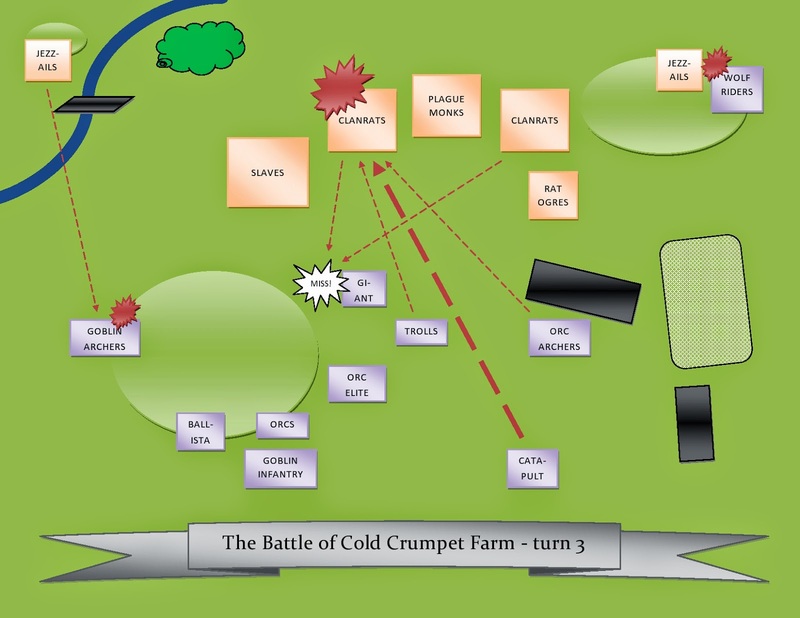 Now that's how to do a battle report! Very entertaining, and those war-machines are beautifully painted. Absolutely brilliant, one bajillion bonus points for creating the maps for each turn. A great read, and a lovely looking battle. Excellent read Sully, your mapping of turn sequence looks excellent and your play by play narrative was truly hillarious. I had such a great time playing we must get together again soon. I can't wait for our next battle. But your prodigious army of Skaven will put me to shame. I've got nowhere near the same forces of orcs. Well, we'll figure something out... I'm sure Xerxes will want his revenge! A great read and well done! Thanks very much for reading, everyone, and for the feedback. This was the longest post I've ever written, so it's gratifying to know that at least a few people made it to the end! 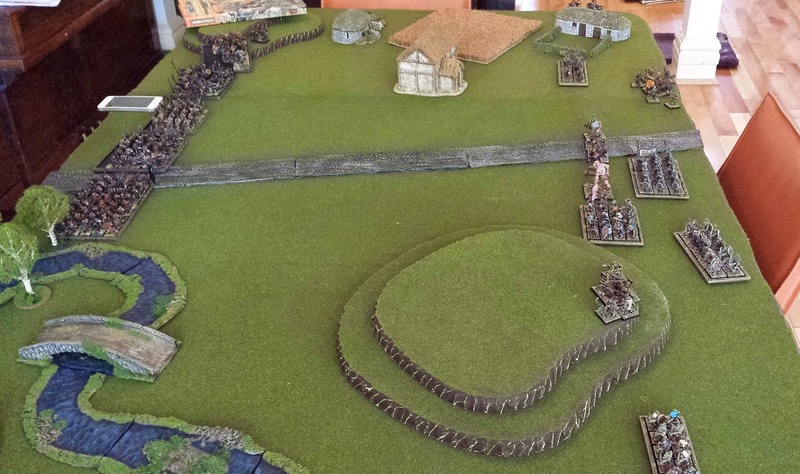 Oldhammer game, old school style battle report! Very entertaining read. Hey, what a wonderful battle report!! Nice looking table too with many enjoyable little details - I love the animals and I imagine the humans cowering inside that beautiful church! And I know your feeling of post-victory embarrassment, Matthew, when it seems that victory was won by big nasty things, but hey, enjoy it, and besides, Giants need all the encouragement they can get!! It looked like you guys had a lot of fun moving some very pretty minis around a great table. Thanks for sharing. I'm a strong believer in populating the table with little touches -- farm animals, civilians and such like. I think it really adds to the whole experience. 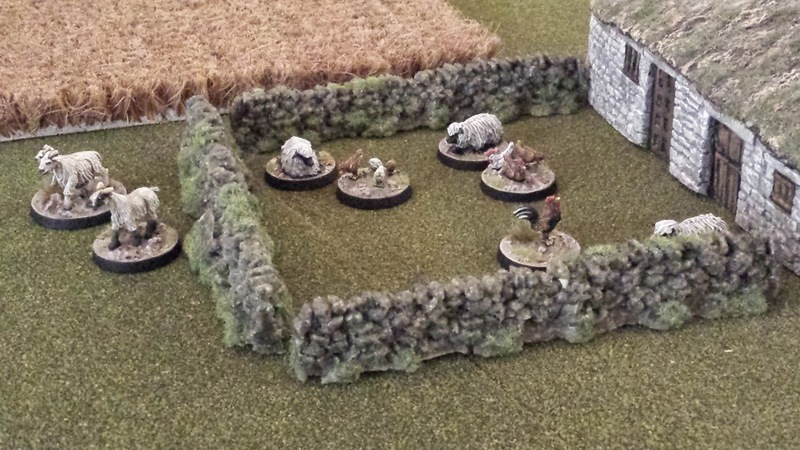 I get a lot of my animals from Wargames Foundry -- they have such great stuff. I enjoyed that report, helped by the excellently painted figures, no doubt. I live in Toronto and have some old pieces to sell that I recently retrieved from my mums attic in the UK. Can you point me in the direction of a dealer/buyer in the GTA who might be interested? Much appreciated. 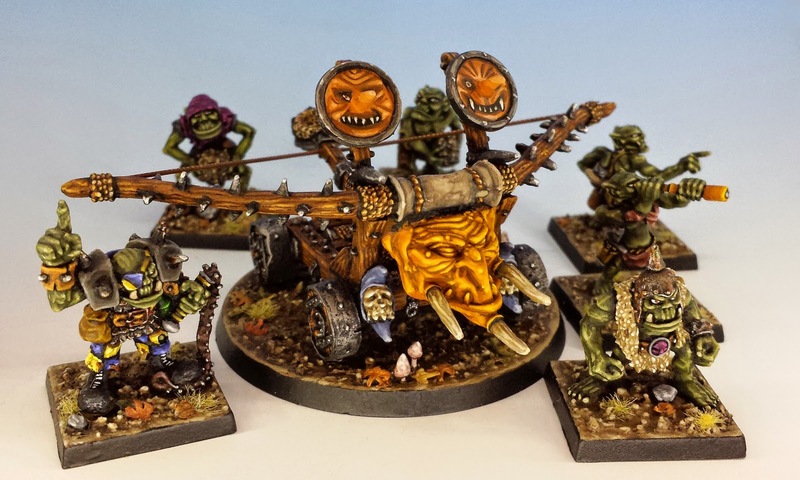 What an excellent report and some gorgeous minis! Really looking forward for Xerxes´ revenge. I'm disappointed that you don't have more photos of the battle, that looks proper oldhammer!